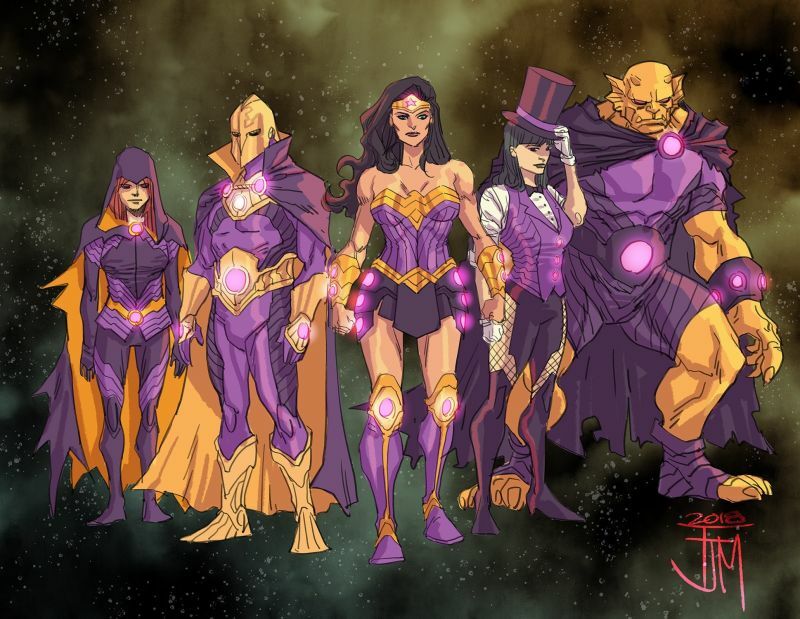 The Epic Review: Epic Editorial: Are 4 Justice League's Better than 1? 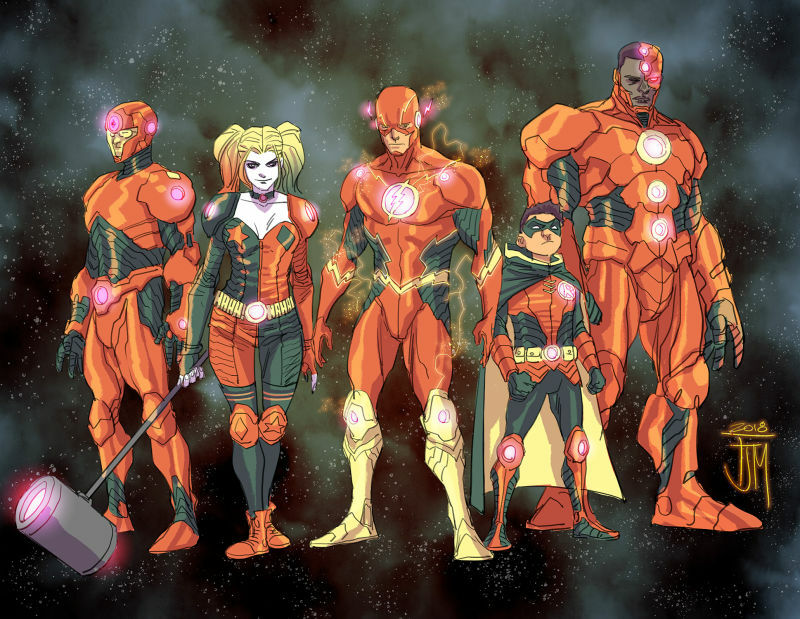 Epic Editorial: Are 4 Justice League's Better than 1? 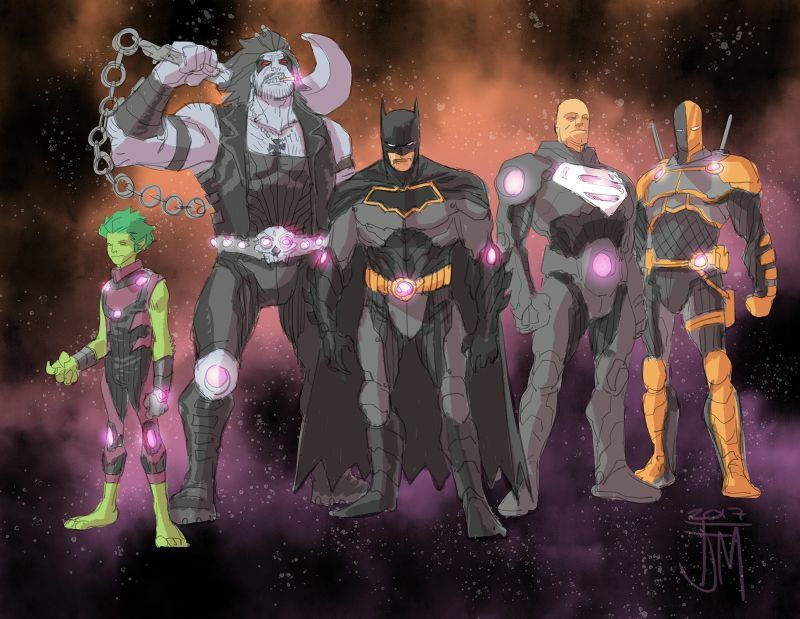 Spinning out of the pages of Scott Snyder's batshit Dark Knight Metal, DC has its latest big event: Justice League, No Justice written by an all-star team of DC talent including: Scott Snyder, James Tynion IV, Joshua Williamson, and artist Francis Manapul. 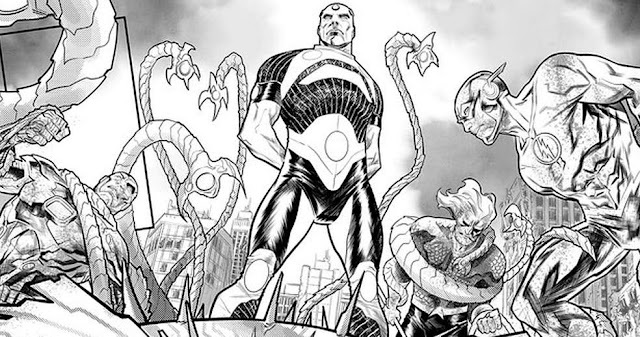 The event will see Superman big bad Brainiac orchestrating a plan that will cause the Justice League to split into 4 different teams, all with unique power sets. No Justice will be a weekly event series starting May 9th and running through the end of May 2017. 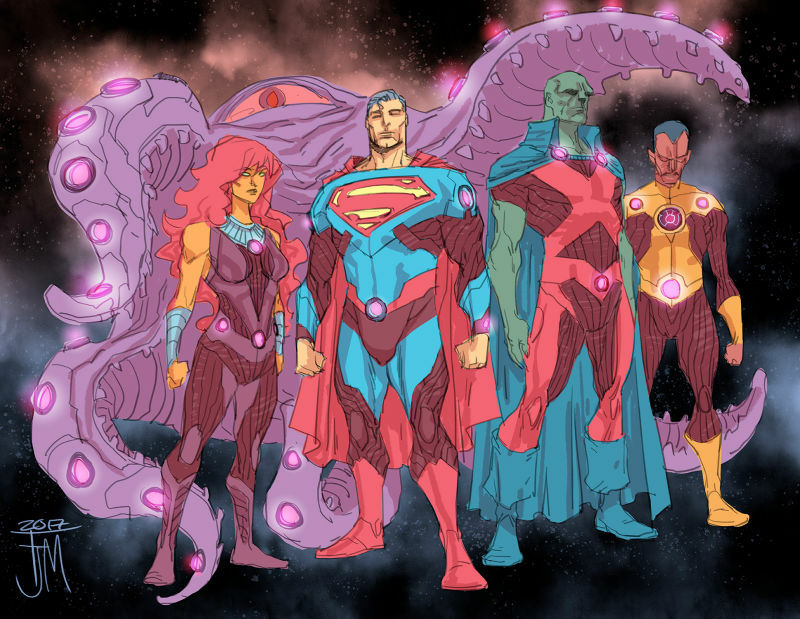 However you don't have to be a brainiac to figure out where this whole thing is going: Weekly Justice League titles for the foreseeable future, leaving comic book readers/collectors everywhere asking the question,"Are four Justice Leagues really better than one?" On paper the concept of four different Justice League teams combing their similar power sets in order to stop Brainiac sounds pretty cool, but as a weekly comic book reader, I can't help but think that this is just a means to an end for DC. An end that will ask avid DC fans to spend possibly $16 plus tax a month on Justice League titles. This comes shortly after Justice League of America Rebirth launched after Suicide Squad Vs. Justice League concluded at the beginning of 2017, bringing the grand total of Justice League titles up to 3 books at $2.99 (Justice League is twice monthly). Here the recipe looks familiar: Big event and then launch a new series, but four new series? Come on DC! The predictable path of a big event followed by a new series is part of a bigger problem among the big two publishers, which is the need to rely on new #1's to keep the industry stable. This leads to forced (and messy) events and titles that are soon forgotten, hence the rise of event fatigue which is nothing new to comics readers. The bigger problem here is the push for weekly series. DC was already asking fans to shell out $6 plus tax twice monthly for most of its major titles since the launch of Rebirth. There are positives when it comes to bi-weekly and even weekly storytelling in comics, the major one being the progression of the stories and their characters. In traditional monthly character titles audiences may have trouble keeping up with a very involved narrative, such as Superman's Oz Effect story line. It keeps the reader from having to read the issue that came directly before in order to refresh themselves on the elements of the story. When this is done in big events such as it was in Brian Michael Bendis's Age of Ultron, it helps them end as quickly as possible, often putting the reader out of their misery, both mentally and financially. The consistent push of weekly books at DC has also lessened their appeal. For example when 52: The Week launched over a decade ago it was a special story with such a unique premise, readers didn't want to miss out on the story rather than feeling like they had to read it. On this trajectory we are starting to get to the point with DC Comics where we are transitioning from event fatigue to weekly event fatigue. So what is a comic reader to do? The simple answer is don't buy the weekly titles, but that is easier said than done. 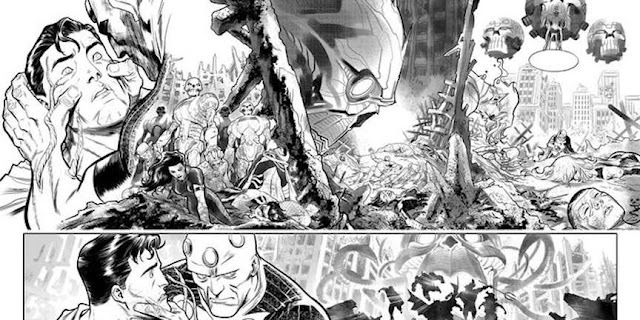 Both DC and Marvel are very smart when it comes to the business decisions of weekly comics because they know that a certain portion of their readership, the diehards (or those of us who actually stuck out Final Crisis) will buy these books, especially the flagship titles such as Justice League, no matter what. Why? Because we are beholden to the characters; we actually love them and what they stand for and crave the emotional jolt they put in our lives as many times as the big two will allow them. From a business perspective the diehard readers also make up for those that drop off of titles every week; Where the average readers who saw Justice League and got on the hype train jump off, old reliables like myself will pick up the slack. The question is do we deserve better? I would say yes, your diehard readership should be rewarded with quality storytelling, which is often lacking in a weekly series due to every other issue feeling like filler. The problem for most within the diehard category isn't money, because just like most people do for hobbies whether it be hunting, fishing, or automobile restoration, money is set aside monthly to support this hobby. The problem arises when loyal customers don't see a consistent return on their investment through organic and entertaining storytelling. It leaves me hoping that both DC and Marvel will worry more about their loyal readership than they do the temporary drive by readers that accompany a big two event or a new #1. Please let us know your thoughts on weekly comics, or Justice League: No Justice in the comments below!  Thanks for the read man, stay tuned for more editorials, and the return of the old school Confirmed Epic Podcast!